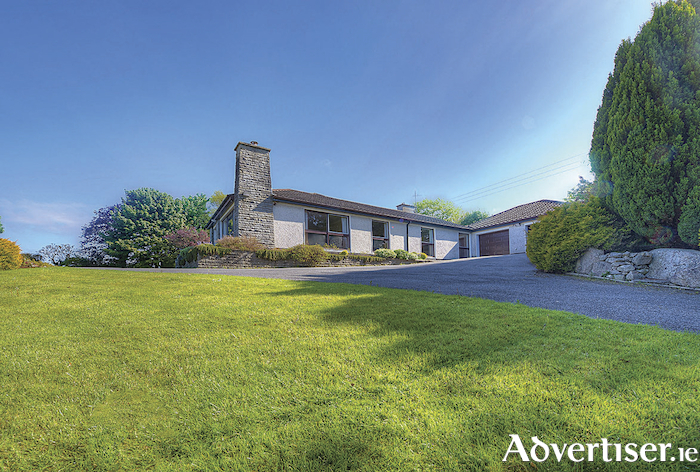 The auction team at DNG Maxwell Heaslip & Leonard are shouting from the rooftops about their latest auction listing, the wonderfully presented four bedroom detached bungalow residence Gortaharda in Ballagh, Bushypark, on the outskirts of Galway city. Open viewings began last Saturday and this spacious family home will certainly attract those seeking a property in this hugely popular location. Set on a private mature site of c0.88 acre, this owner occupied home is beautifully presented and is in pristine condition. From the moment you drive through the entrance, the tarmac drive and the manicured gardens are the first indications that this is a home of distinction. Comprising approximately 2,500sq ft of living space, the elevated house is extremely bright and spacious, with large windows taking full advantage of the aspect. The existing owners obviously took time and care when designing the finished house and chose a neutral colour scheme that enhances the use of solid wood floors, which in turn gives a real homely feel to the property. Off the main hallway is a large living room which offers wonderful views and overlooks the front gardens. Adjacent to the living room is a formal dining area, which in turn leads to the fully integrated kitchen. From the kitchen, there is the stunning sitting room with raised open fireplace, beamed ceilings, and sliding doors to the rear patio, a perfect place to spend quiet winter evenings and long summer nights. The bedrooms are all doubles, with the master bedroom having a well-proportioned en suite which is fully tiled, and a large walk-in-wardrobe. The bathroom, in keeping with the rest of the house, is spacious, and is fully tiled. A utility room from the kitchen leads directly to a large American style garage with a twin entrance and parking available for two cars. Selling agent James Heaslip commented: “We are over the moon to have the sale of this property. There is a shortage of quality family homes in this price bracket and we need more listings like this to meet the demand in the area. Bushypark has always been a hugely popular location, and is especially sought after. Aside from the amazing gardens and its elevated aspect with great views, it is a beautifully finished home and is really well laid out. It is a credit to the existing owners. Whoever buys this special property will just take up the running from our clients who have had many years creating happy memories in this wonderful area." Gortaharda, Ballagh, Bushypark, will go to the auction floor on Thursday December 6 with an attractive guide price of €590,000. Open viewings are on Saturdays between 2pm and 3pm. Full particulars are available from the auction team at DNG Maxwell Heaslip & Leonard at 091 565261.